In 1973 Mrs. Chhaya graduated from Jai Hind college, Mumbai University with a bachelors’ degree in Arts with Economics and Political Science as major subjects. Thereafter she acquired a bachelors’ degree in legislative laws from the Government Law College in 1976 and was admitted to the Bar Council of Maharashtra and Goa. Simultaneously she did her Articleship for two years and passed her examination of Articled clerks (Solicitors) in the year 1979 – 1980 and became a member of the Bombay Incorporated Law Society. Chhaya was a partner in M/s. Haridas & Co. a firm of solicitors and advocates from 1979 – 1980 to 1996 0 1997 and thereafter she practised independently till she joined M/s. 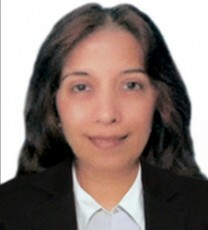 ALMT Legal Advocates and Solicitors in June 2011 as Senior Consultant. Under the guidance of her late father who was a solicitor and senior partner of a law firm she specialised in property matters and she continued her practise in transfer of properties and conveyancing. Her major area of practise is related to conveyancing and property transaction. Documentation relating to redevelopment of societies’ properties in Mumbai. Documentation relating to purchase and acquisition of properties such as flats, shops, office, lands etc. Documentation relating to deemed conveyance. Documentation relating to all types of Agreements such as agreements of tenancy, lease, leave and license, lease deeds, commission agreements, hire purchase agreements etc.